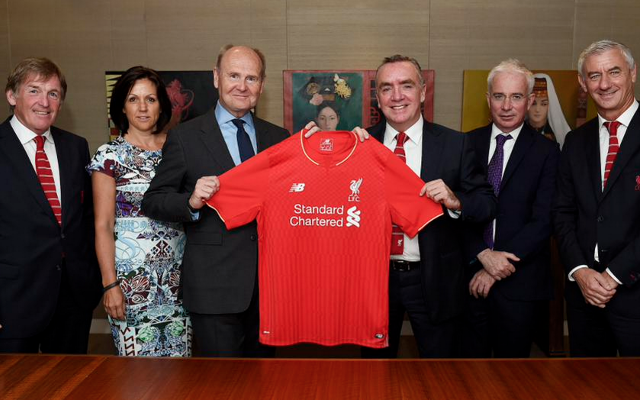 Liverpool have signed a three-year extension deal with the club’s main sponsor Standard Chartered Bank. The Reds have been partnered with Standard Chartered since July 2010, and announced on Tuesday afternoon that the extension would run through until May 30, 2019 – the end of the 2018-19 season – a statement on the official Liverpool FC website read. According to the Mirror, the Liverpool hierarchy reportedly wanted to secure a deal worth around £30m per-year, but the financial terms have been kept confidential by the club. During their five year partnership, the club have been seen supporting the bank’s charitable programmes – most notably Seeing is Believing – with the logo having replaced Standard Chartered on players’ shirts. The Merseyside club’s annual ‘Perfect Match’ game is part of the Seeing is Believing programme, and has raised over $340,000 to challenge needless blindness. “This extension further demonstrates the great strength of our long-term relationship and the success of our partnership with Standard Chartered. “The sponsorship of the Liverpool shirt is extremely prestigious and only five brands will have adorned the shirt in the 40 years since we created the sponsorship opportunity,” he continued.